No, Google has said that there was no Penguin update. But can they be trusted with all evidence alluding to such an update? On the morning of Wednesday May 28th 2014, Search-Engine Land's Barry Schwartz noted that there was a lot of Internet buzz around the possibility of Google having rolled out a Penguin update. Apparently, the SEO space was awash with enormous changes in search results from sites that were previously penalized by Google, with several of them being impacted by the alleged update. Google’s Penguin algorithm is a computer code that targets sites that try to manipulate their search results via link-building efforts that, according to the search engine giant, is deemed abnormal or un-natural. This is not the same as the manual actions on un-natural links but rather a computer algorithm that has the capabilities of automatically detecting such kinds of links. The algorithm aims to decrease search engine rankings of sites that contravene Google’s webmaster guidelines by utilizing unorthodox SEO techniques (that have otherwise been termed as black-hat) that artificially increase a webpage’s ranking through the manipulation of the total number of links that point to that webpage. These kinds of tactics are also termed as link schemes. Google first announced the Penguin algorithm in April 2012. A spokesperson of Google informed Barry Scwartz’s group at Search-Engine Land, that currently, there is no Penguin or any other spam efforts going on. So this latest update, at least in Google’s own words, is not spam-related. In fact, Google’s explanation made everything sound like there never was any update at all. But many webmasters have raised concerns about a change in SEO rankings over the past few days. But it should also be noted that this is independent of the Panda 4.0 Update, which happened about a week or so ago. Most of the webmasters said that the Penguin update affected their websites that once had Penguin issues before. Nevertheless, not all of the affected webmasters were actually convinced that the change in SEO rankings was indeed related to a Penguin update. But whichever way any of them looked at it, several webmasters and SEOs noticed changes in ranking. Some webmasters went on to share their analysis of the change in rankings with Mr Schwartz. A good number of them showed enormous changes in Internet traffic as well. Others just alleged Penguin and/or other forms of recoveries. 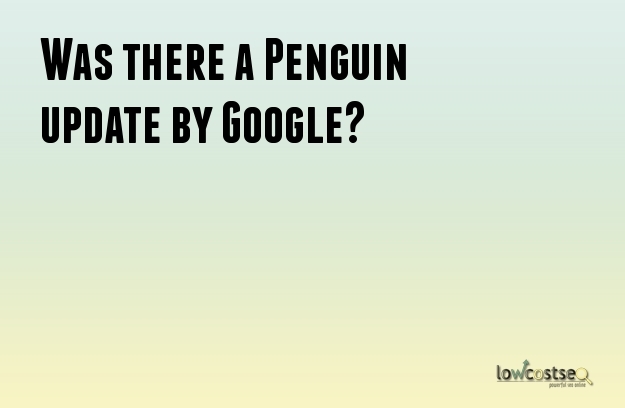 After Schwartz had responded to some of the SEOs informing them that Google had said that there wasn’t any Penguin or any other update, a section of them questioned Google honesty with admitting that there was indeed a Penguin-related update. This incident will surely send chills down many webmasters’ spine, as they scramble to remove bad or spam links to avoid the real update when it officially comes. As suspicious as most of us still are with regard to the recent fluctuations, the volatility associated with ranking on Google means that only by playing it safe can we ensure the safety of our websites.